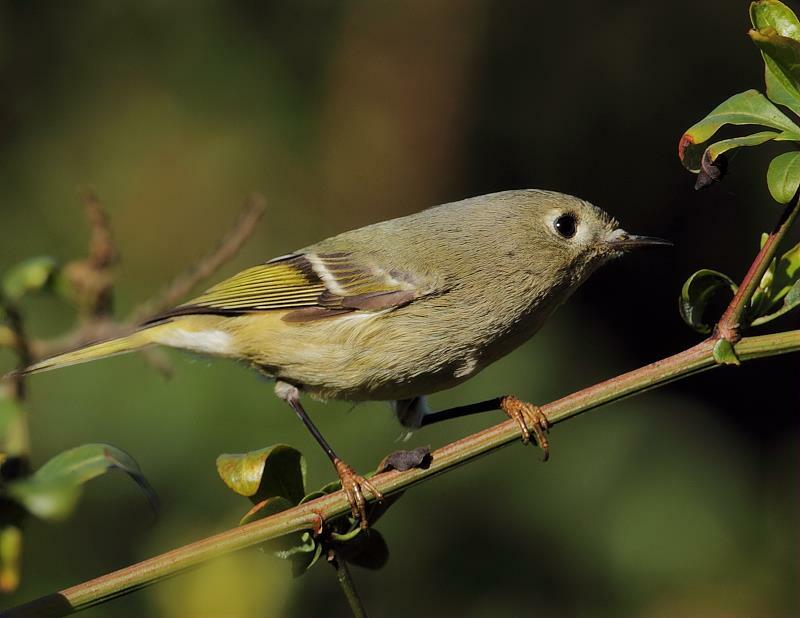 Most of the time, a Ruby-crowned Kinglet is neither ruby nor regal. A tiny songbird washed in faded olive-green, the male shows a hint of crimson atop of his head — hardly a ruby crown. But don’t forsake the kinglet for flashier birds. 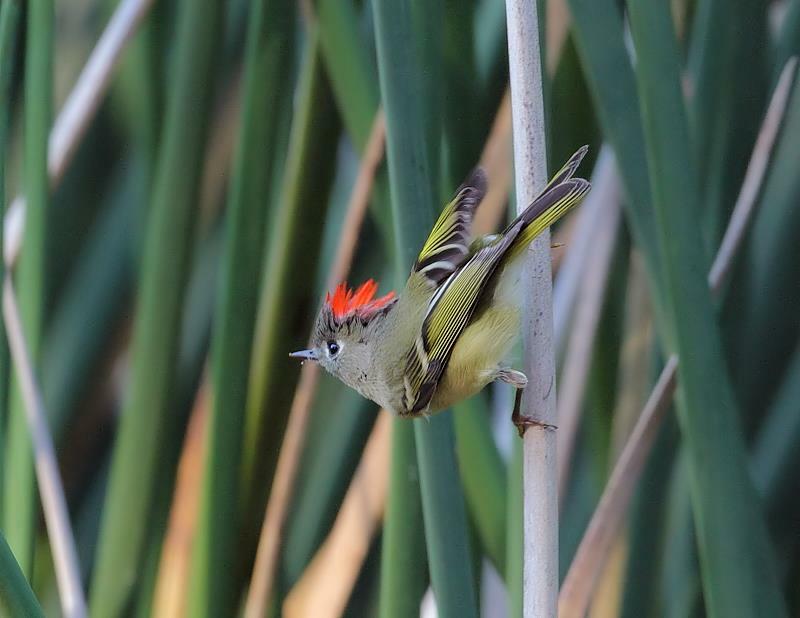 When courting a female or dueling with another male, the kinglet exposes those ruby feathers, and his crown glows with the feathery fireworks that give the bird its name. Now is the time to look for kinglets, as they migrate north across much of the continent toward breeding sites in remote evergreen woods. 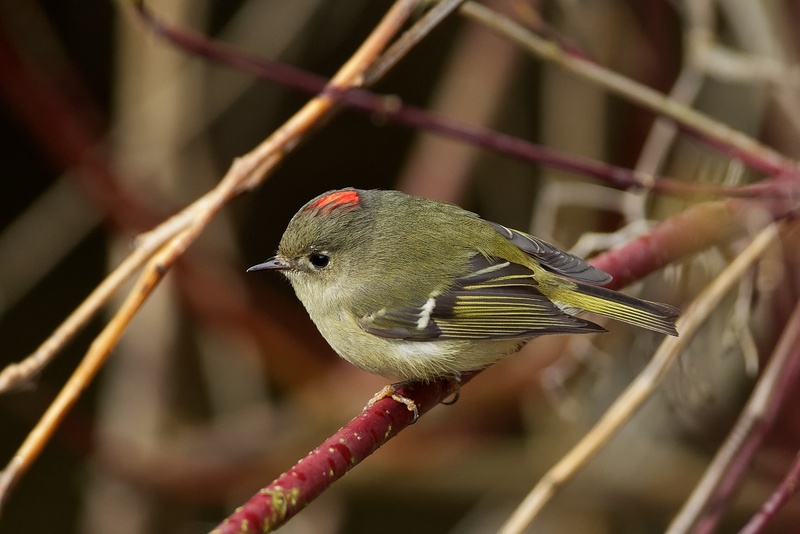 Most of the time, a Ruby-crowned Kinglet is a fraud with feathers — neither ruby nor regal. Just a tiny songbird washed in faded olive-green, with a wingbar and messy eye-ring. Sure, the male shows a hint of crimson atop of his head — but hardly a ruby crown to justify his name. 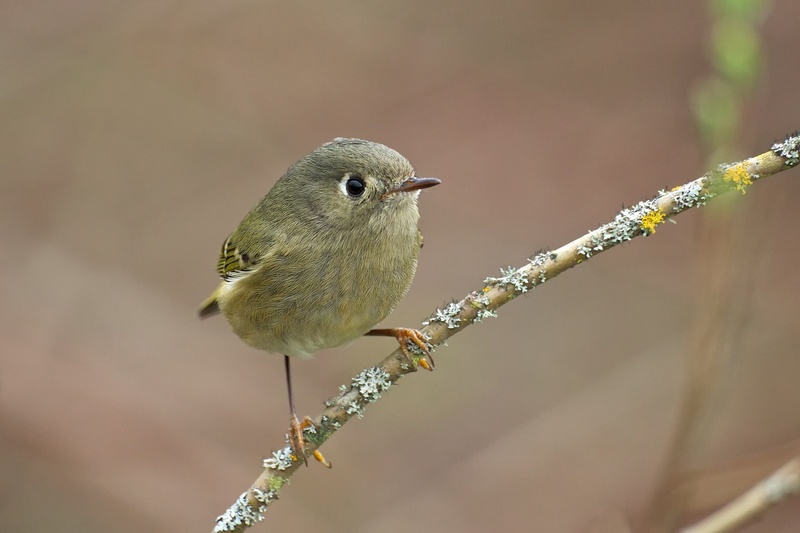 But if you forsake the kinglet for flashier birds, you’ll miss one of nature’s great events. It begins … with a song. That mile of music comes from a bird four inches long and weighing about a quarter of an ounce. But the show is only beginning. When courting a female — and often when dueling with another male — the kinglet unleashes the true fire in his crown. He begins to expose those ruby feathers, and his crown glows like an ember. 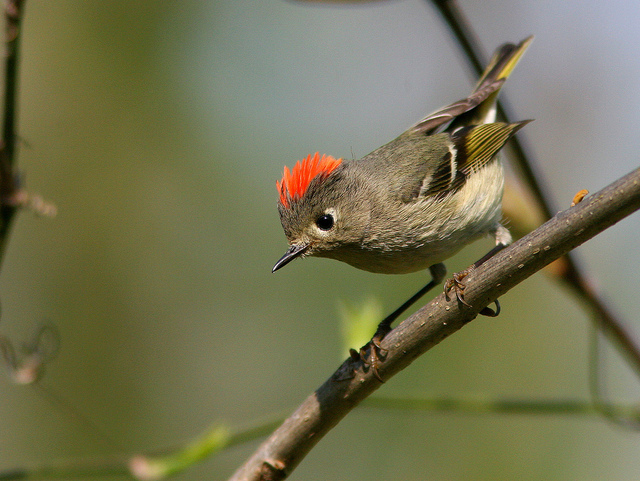 Then, in an instant, the crown ignites — at long last, the feathery fireworks that give the Ruby-crowned Kinglet his name. And then, in another instant, the show is over, and the crown recedes — at least until his next performance. Now is the time to look out for these fireworks, as kinglets migrate north across much of the continent toward breeding sites in remote evergreen woods. See the display at birdnote.org. Bird sounds provided by The Macaulay Library of Natural Sounds at the Cornell Lab of Ornithology, Ithaca, New York. 49741 recorded by Kevin J. Colver, 206445 recorded by Bob McGuire, and 94354 recorded by Wilbur L. Hershberger.